Today we take a look at Looney Labs' latest party game, Choose One! The decisions you make during this game will stir up conversation at your game night, party, or other social gathering. The box includes a small board that is really more of a score track, with a start space, 1-10 spaces and a finish space. It's a bi-fold board. 300 Choose One Cards--These are the main/only mechanism to the game; they all have two choices on them: One choice has a white background while the other is purple. 20 Voting Cards--10 white, and 10 purple,and each player receives one of each at the start of the game. 10 Pawns--These are random pieces, everything from a from a wooden car to a plastic hot dog. 1 Felt Bag - To store the pawns in. Setup is quick and easy: Each player selects a pawn and takes 2 voting cards (one white, one purple). Players place their pawns on the "Start" space of the board and you select a beginning player. The first player assumes the role of the "Chooser" (yes, that's what they call it in the rules), and the Chooser chooses a card, looks at the two choices on the card, and places a voting card that indicates their choice face-down. All the other players reveal their vote (we always did it on a count of three, so that players wouldn't have an advantage if someone knew the Chooser better than others). After the votes are revealed, scores will be tallied and pawns will be moved. If no one guesses the correct (matching) choice, the Chooser scores 2 points. If at least one player guesses correctly, each player who chose correctly gets 1 point (including the Chooser), but if everybody guesses correctly, then no one scores. Once a player moves into the Finish space, he or she wins. If there's a tie, play enough extra rounds to declare a winner. Jeremiah--The components for this are really quite simple: The cards are a little thin, but the design is colorful and the colors for your choices are quite easily distinguished. I like the hodge-podge of items that are used for the pawns and the little felt bag is a nice touch. If I had one small complaint about the components, is that typically games of this type also come with a smaller box within the larger box to hold the cards. This does not. So you find yourself passing the game box around or leaving it on the table, it was a little clumsy at times, but definitely did not ruin the experience for me. Firestone--I agree. The different pawns are fun, and certainly in keeping with Looney Labs' aesthetic. And I agree about the box, too. Even a functional divider would have been helpful, but this was just "Here's a box full of cards. Good luck keeping them organized!" Not a deal-breaker at all, though. Jeremiah--The concept of this game isn't terribly original, but it's still fun. This game makes for a perfect ice breaker for social gatherings. I don't know that it's all that great for a gamers' group, unless it's used as a filler for a group of gamers who don't know each other all that well. Firestone--This didn't work with gamers at all. We ran through a round, realized it was an ice-breaker game and not really a how-well-do-you-know-your-friends game, and quit. The problem is that the questions aren't equal. I know...I know... 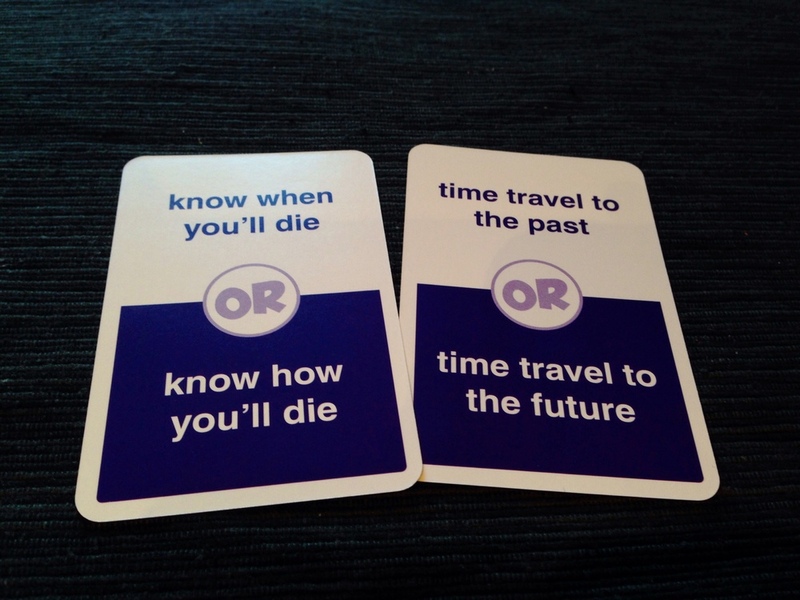 I'm overthinking the cards in a party game. Maybe. Some of the questions create genuine unknowns, where even friends wouldn't know which you'd choose. "Flower Garden or Vegetable Garden?" or "Butterflies or Fireflies?" Those are choices most of my friends won't know. But then there are ones such as "Mac or PC?" or "Rock or Country?" Well anyone who knows me is going to know the answer to those. So overthinking? Sure. But I don't think this is a good game for people who already know each other. It would be a fine icebreaker game. Jeremiah--This game actually came at the perfect time for me: It showed up right about the time I took my new position in youth ministry. I've used it to get to know students a little better, strike up conversation and had some good laughs around the table with it. I've even pulled random cards from the box and used them during a youth service as an ice breaker to get everyone talking. Firestone--I can see it working well for that type of situation, but not many others. Jeremiah's Final Verdict--This is a fun game for the right settings. It's definitely a light party game, but at the same time it's pretty flexible so those settings are easier to find than you may think. Overall It's a fun little party game that will strike up great conversation and shared laughter with both strangers and friends! Put this on the table! We'd like to thank Looney Labs for supplying us with review copies of Choose One! This in no way influenced our opinions. We'd love it if you subscribed to our little blog over on the right! Also don't forget to look for us all over the internet, Facebook, Twitter, Instagram, Youtube, and our Podcast! Reverse charades is like charades...in reverse. Instead of one person trying to get multiple people to guess a word or phrase, Reverse Charades is multiple people trying to get one person to guess a word or phrase. And it's a ton of fun. 1 set of rules—the easiest, simplest rules card we've seen in a long time. Players are divided into teams of at least 3 or more players. When it's a team's turn they choose someone to be the lone guesser and the rest of the entire team takes the stage! The other team then holds the cards and reveals one at a time so only the actors can see them, and then the zaniness commences! The team of actors has to act out as many of the clues as they can, scoring a point for each card they get the guesser to correctly guess. The one strict rule in the game is that you can not make a sound, you can't mouth words to another actor, or to the guesser. But you are certainly allowed to use objects, and people as objects, to get the guesser to shout out the word(s) on the card! Play continues until a point goal is reached, or until everyone is laughing too hard and can't go on any further! Jeremiah—If there's one downside to the game it's that it requires a larger group (at least 6 people or more) to get a game going. And that's not much of a downside, it's just the nature of how the game works. Anything less and it's just plain old Charades. Jeremiah—I love that there are a ton of words/cards included, I'm very interested in checking out the expansions. (Especially the holiday edition! I think this would be a great game for a Christmas party!) I will say that the best and most fun clues were ones that required a team effort. Things like clothesline, assembly line, etc. Jeremiah—The concept is such a simple twist on (what I feel is) something that is kind of worn out. But that twist makes it about a million times more fun than the original. We found that folks who wouldn't normally feel comfortable playing charades in a traditional format—getting up by themselves and feeling singled out—jumped right up when there were other victims involved in the public ridicule! Jeremiah Final Thoughts - We had a TON of fun playing this game! It definitely takes a party atmosphere to get it going; it's not your typical Board Game Night type of game. This is a top-notch party game, a very well done spin on something that has been public domain for some time. Reverse Charades will be a part of my party game collection and find its way out to many parties and large gatherings! Firestone Final Thoughts—This is definitely going to every party with me for the foreseeable future. Everyone had a blast, and we laughed A LOT. If you're sick of Apples To Apples and Scattergories, give Reverse Charades a try; you won't be disappointed—unless you're at the bottom of "Dog Pile." Ouch! By Firestone Remember the classic youth group game Spoons? What's it known for? Bloodshed... Well if you like Spoons, you'll probably like Jungle Speed—which plays up to 10 people. Once it's out of the now-unnecessary box, it's a simple cloth bag, a set of rules, a deck of 80 square cards, and a plastic "totem." The goal is simple: Get rid of all of your cards. Like Spot It!—which we reviewed a few weeks ago—there are a few variants that mess around with how you deal out cards and how the game is played and so forth. In the basic game, you place the totem in the middle of the table, shuffle the 80 cards, and deal them out as evenly as possible to everyone playing. In turn, players flip over the top card of their stacks—using only one hand—to create a face-up discard pile. The cards feature various designs of various colors. Whenever a just-flipped card matches the design—not the color—of another card on the table, those players are now in a duel! Both players try to be the first one to grab the Totem. The loser takes the winner's cards, their own discard pile, and any cards that might be in the middle of the table (from other card effects I'll get to), and place them face-down under their draw stack. Play continues as before, with the loser of the duel starting. The insidious thing (and I mean that in a good way), is that the designs look VERY similar. So often people will incorrectly grab the Totem—and in that case they have to take all of the face-up cards on the table. That's the same penalty you take if you accidentally drop the Totem as you're trying to grab it. There are a few special cards, such as one with a bunch of arrows pointing in, and everyone is basically in a duel as soon as that comes up, with the winner placing his or her discards in the middle of the table under the Totem. There's also one that changes what triggers a duel to matching colors, rather then designs—so one more chance for you to accidentally grab the Totem and mess yourself up. That's basically it. So let's talk about the Totem. It's just a plastic piece that you grab. You're not worshiping it or praying to it or anything else related to the traditional Totem you think of in other religious traditions. Since it's just a name, if you felt strongly about it, you could easily change the name of your Totem. Call it the banana, or the grabby stick or the whatever. 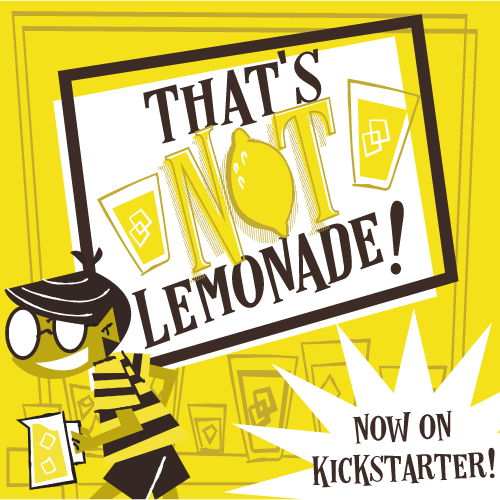 Bottom line: It's not the best party game I've played, and it's certainly not the worst. But it's a fun, party game that everyone can play, and would be great for a group of teenagers. 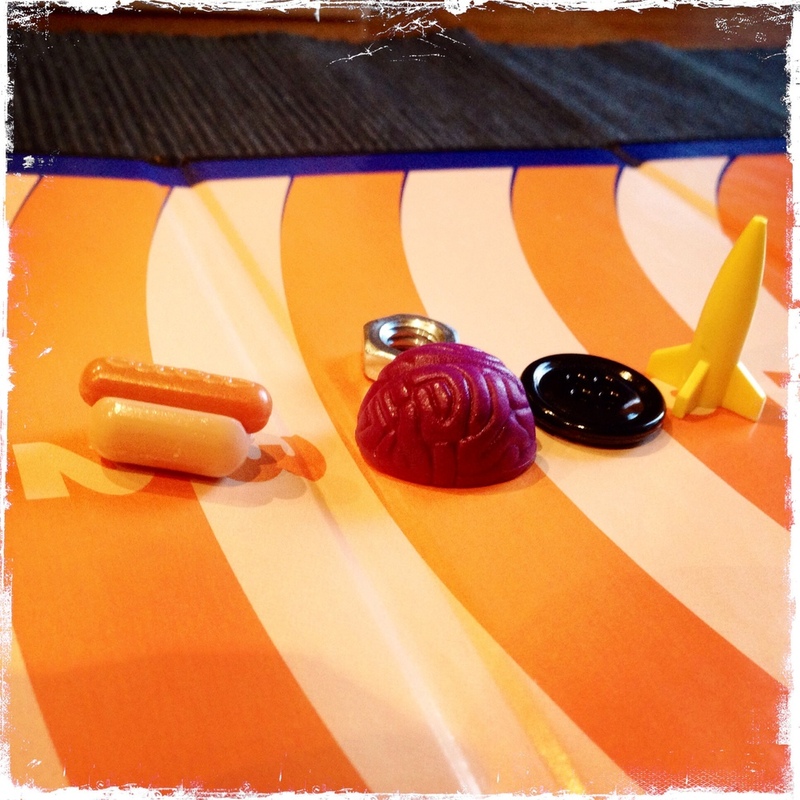 Earlier this week we reviewed a fun little party game called, What's it to Ya? Today we launch a contest to win yourself a free copy! So, here's how it works, it's pretty simple, just follow this link RIGHT HERE! And like our Facebook page to enter! And that's it! We'll close entries at midnight on Friday Aug. 3rd, so head on over and get your entries in! Thanks for reading! We'd love to hear your feedback on what's going on here at TOG, please leave your comments here, or on the Facebook page!